Wall between two exhibitions at the Delaware Historical Society. 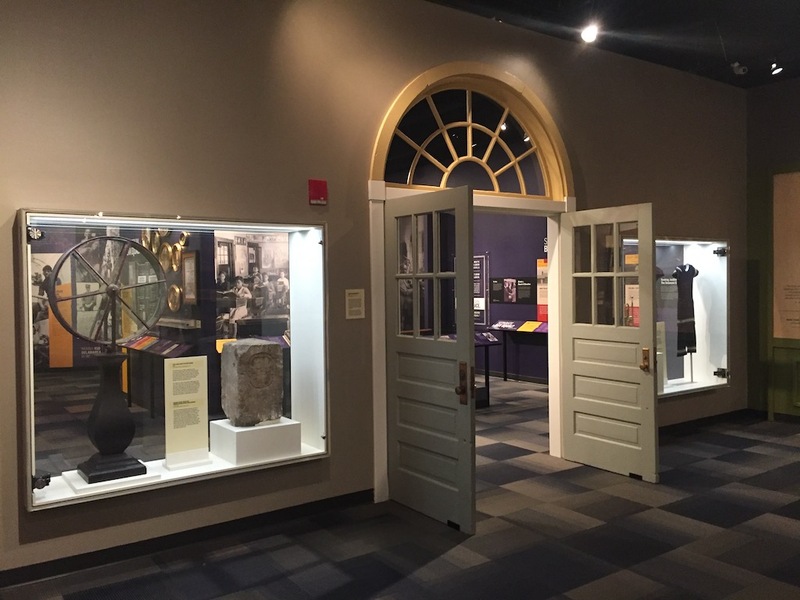 The Delaware Historical Society reopened their museum last fall with two new complementary exhibitions designed by the Gecko Group, one a comprehensive history of the state and the other on the history of African Americans in Delaware. I recently visited the museum with Scott Loehr, the CEO, who pointed out a clever interpretive technique. The two exhibitions share a common wall, which has a doorway that allows visitors to walk from one to the other and exhibit cases on either side. It’s not immediately obvious, but the objects on display are interpreted differently depending on which side of the wall you’re standing. After the long dispute between the Penn and Calvert families over the boundaries between Pennsylvania (including Delaware) and Maryland was settled in 1750, Charles Mason and Jeremiah Dixon came to the area in the 1760s to make a final, definitive survey of boundary lines. They surveyed Delaware’s western and southern borders. They also surveyed the boundary between Pennsylvania and Maryland, now known as the Mason-Dixon line, that stretched west from Delaware’s circular northern border. Small stone markers were placed every mile and larger crown stones were placed every five miles to mark the line. For many people, the Mason-Dixon Line, which marks the border between Pennsylvania and Maryland as it runs west from Delaware’s circular northern border, is more than a state boundary. It also marks a political and cultural division between the North and the South. After Pennsylvania abolished slavery, the line divided free states from slave states. As the nation grew, the Mason-Dixon line extended westward, at least symbolically. For enslaved people seeking freedom, often fleeing with the help of the Underground Railroad, crossing the border into Pennsylvania was the first step toward liberty. But because the Fugitive Slave Act of 1850 required captured slaves to be returned to their owners, the North was still unsafe. Nonetheless, it represented hope and provided access to people willing to help freedom seekers make their way to Canada, where slavery ended in 1834. This entry was posted in Historical interpretation, Museum and tagged African American history, Delaware, Delaware Historical Society, Exhibition on February 21, 2017 by Max van Balgooy. I have spent a long career interpreting historic sites and I wholeheartedly endorse the idea of teaching/interpreting multiple perspectives. However, if the audience for the two exhibits are self-selecting and don’t see both sides, then the labels only tell one story, right? In fact, if there is a predominantly white audience for one exhibit, and a predominantly black audience for the other exhibit, I would argue that the labels would do more good if they were switched. My advice is to tell both stories in both exhibits.